For the man who doesn't just enjoy being outdoors... he belongs there. A truly superior Rocky Boot, made comfortable AND 100% field-tough for harsh, wet, downright vicious conditions! Built with Guaranteed Rocky Waterproof construction...so you can traverse muddy landscapes, soaked settings and taunting streams with the confidence that only comes with a waterproof boot. Packed with 600 gram Thinsulate Ultra Insulation for serious cold. And a proven Sport Utility outsole that keeps you stable and upright on aggressive climbs. Whether you're a hunter, hiker or all-around explorer, this Boot is built to protect the feet that carry you from one conquest to the next. 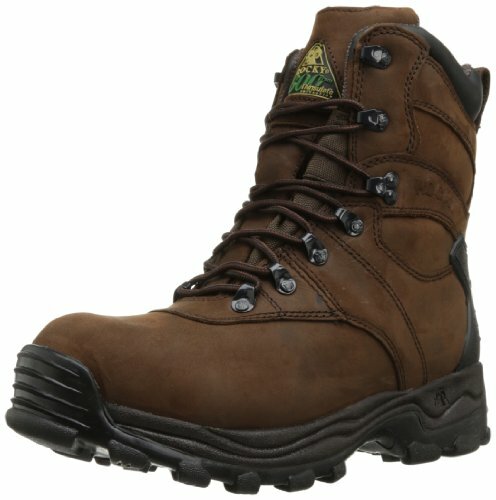 Full-grain leather and nylon uppers are ultra-durable; Guaranteed Rocky Waterproof construction for sure-dry comfort; 600 gram Thinsulate Ultra Insulation for warmth in cold environs; Sport Utility outsole for traction and stable footing on ridgelines, sharp climbs, and more; Reinforced at the toe and heel for added durability; Waterproof: Yes; Insulated: 600 gram Thinsulate Ultra Insulation; Upper: Full-grain leather and nylon; Insole: Polyurethane; Outsole: Sport Utility; Construction: Guaranteed Rocky Waterproof; Height (approx. ): 8"; Mfg. Number: 7480.